Clinton, Michigan – Organic EDEN Shoyu soy sauce, Kidney Beans, and Dried Blueberries were selected for Men's Health magazine's 125 Best Foods For Men annual November feature. This is the tenth time EDEN brand food items have been honored in multiple categories by Men's Health. EDEN Shoyu was honored as 'Best Soy Sauce' in the 'Best World Foods' category. EDEN Kidney Beans and EDEN Dried Blueberries were chosen 'Best Beans' and 'Best Dried Fruit' respectively. We applaud their good judgement. EDEN Shoyu is extraordinarily fine soy sauce made of Non-GMO organic soy beans and organic wheat by brew masters skilled in traditional methods. Aged in wood casks for 2 years, it brightens food flavors and brings out depth of character where used. 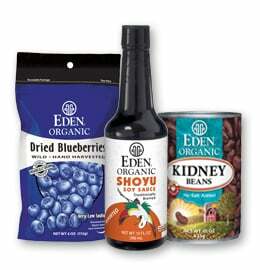 EDEN Kidney Beans are organic U.S.A. family farm large red kidney beans. All EDEN beans are packed in BPA, BPS, and PVC free lined cans since April 1999. No salt added, good protein, and hearty nourishment. EDEN Dried Blueberries are wild, handpicked, lowbush organic blueberries. No refined sugar, sulfates, or preservatives. Available in 1 pound, 4 ounce recloseable packages, and 1 ounce go anywhere Pocket Snacks. These three Men's Health honored EDEN items are pareve. Eden Foods is a 47 year principled natural food manufacturer offering more than 400 authentic, organic, traditional, pure foods. All are superb pantry fare. Further information and over 1,140 free recipes are at www.edenfoods.com. Retailers, institutions, and co-ops, please visit us at access.edenfoods.com.